fleet street fox: The hunted in praise of the hunter. 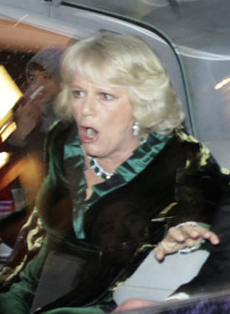 CAMILLA Parker-Bowles spent years being the most hated woman in Britain. At the wrong end of a newspaper free-for-all, she had long lenses shoved through her garden hedge, cartoonists mocking her looks, and columnists lambasting her morals. MI5 listened to phone calls with her lover and leaked them to the papers, which set up premium-rate phone lines so everyone could hear the heir to the throne tell her he'd like to be her tampon. When she went to the supermarket other customers pelted her with bread. And this week she praised the Press for scrutinising every corner of modern life without fear or favour. Presenting awards at the Press Club - and no doubt choosing her words carefully - she said: "I take enormous pride in our ability to question, debate and criticise all aspects of our society. I believe passionately in freedom of expression. I believe freedom of expression, so long as it doesn't contravene the law, or offend others, to be at the heart of our democratic system. In this, you [the Press] play a vital, if not pivotal role." Then she said her personal motto with the papers was "no news is good news" - echoing neatly my belief that those who keep their heads down and their noses clean have no reason to fear a free Press. I'm actually starting to warm to the old boot.